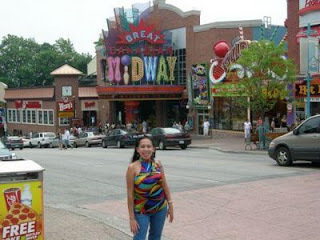 July 12, 2008 - We had one more extra free day, so we thought of visiting Clifton Hill, just 1 block away from the falls and Queen Victoria Park. Clifton Hill is full of amusements and great attractions. Generally, it's being described as a big amusement park in Niagara that has rides, sports and more. Shopping areas are also in the area. there's a factory outlet there where you can buy cheap items including gold :). If you love amusements and rides, one day might not be enough. Plan for at least 2 or more days at least.